The Classic Club Spin number 18 picked Breakfast at Tiffany’s by Truman Capote for me which was one of the few novellas on my list – not exactly the chunkster the organisers had urged us to choose for the extra long time period allowed – but I was pleased since my last classic seemed to go on for an age! Once it was picked I then decided to investigate a little more – you can read my full post here. This is an intriguing novella that I can imagine packed quite a punch when it was first published in 1958. Holly Golightly (what a fab name) is the object of our narrator’s fascination. He lives in an apartment above hers in a brownstone apartment in Manhattan’s Upper East Side where he writes. Holly is a country girl although her past is a bit of a mystery. She has no job she lives off others good favour including Sally Tomato, who she visits in prison, every week. For this service she gets paid $100. In between times she is treated well by the wealthy men and she assumes that sooner or later she will marry one of them. Of course to the reader, Holly Golightly is not just a good time party girl. It is far more likely that she is an expensive sort of call-girl but one that I think that appeals to the female readers of the book as the fictional men who clearly like her. The story told seems on the surface to be quite a simple one. It certainly isn’t long and yet there is something very captivating about it, both in terms of the characters and the writing style. Truman Capote is one of those writers whose work does not seem to have dated in so many ways. The style used is of the enquiring nature of the narrator that blends perfectly with not an urgent need but a more gentle yearning to understand this young woman more. For me the key seemed to be in the past, I had the feeling if we could unwind far enough we would see the foundation to the creation that ‘our’ Holly clearly is. This meant almost back-to-front as usually we want to know where a character is going, but perhaps I knew ultimately where that would be and so I felt if we could go back first, maybe a slightly different path could be walked. Who knows? What I do know was that I was as charmed by this young woman in a way I simply did not expect to be. I felt sorry but wholly unsurprised as she was thoughtless and careless with others and equally sorry for our narrator and the barman who had this bright young thing in their orbit, and then they lost her. 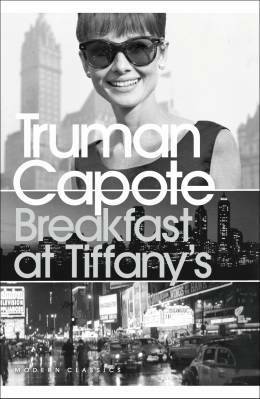 Breakfast at Tiffany’s is number 14 on The Classics Club list and the nineth of my fifty choices that I’ve read and reviewed. Yup, I’m a little bit behind! I’ve not read Breakfast at Tiffany’s but your review has made me want to read it. Great post. Fabulous review! I remember hearing this read on the radio years ago and really enjoyed it. Just this week I’ve finally bought a second-hand copy of the DVD from Acorn charity shop up at Trinity for 50p. I can’t wait to watch as I’ve only ever seen clips and not the whole film. One of my fav movies..EVER Cleo but I have never read the book. A fantastic review. Must buy! This is one of the few classics I wouldn’t mind reading! Hi Cleo! I was glad to see your post about Breakfast at Tiffany’s- I also read it and liked it very much. Holly’s character is very interesting in the novella – much more so than in the movie, although I also liked that. I think Truman Capote was an excellent writer, though I haven’t read In Cold Blood yet. I love this book, so glad you enjoyed it too. I loved everything I’ve read by Truman Capote. I’m so glad you enjoyed this one, Cleo. I think Capote created such a memorable character with Holly. You can understand how people are so drawn in by her character – at least I could. And the setting just works perfectly for the story, in my opinion. It’s rather haunting, if I can put it that way. A delightful tale that was even more so after I had seen the movie. Then I would ever after visualize the parties and the brownstone. Plus, there is something so mysterious about Audrey Hepburn. Glad you enjoyed it! Think it is one of my favourite Modern Classics; Capote’s writing is superb. I’m glad you enjoyed this one, I loved it when I read it. I love the film too even though they’re so different. I enjoyed your wonderful review, Cleo. The movie was good and I don’t know why I never got around to reading the book. Probably wasn’t something I was interested in back when it was published. Really interesting review Cleo! I’m not a fan of the film but a few people have suggested to me that I read the novella as it’s quite different. It sounds a fascinating character study of Holly. Have heard so much of this book the film and Hepburn but did not know the story till now. Thanks for the review.